Copyright: © 2018 Silva DLR, et al. This is an open-access article distributed under the terms of the Creative Commons Attribution License, which permits unrestricted use, distribution, and reproduction in any medium, provided the original author and source are credited. Anatomy is a Geek word formed of two parts; Ana=up & tomy=cutting. Anatomy is the main basic medical science; and represents the language of medicine. It is the study of structure of the human body . Although anatomy is fundamental to health education, in various circumstances students perceive their need only when they are at the side of a bed or, especially medical students, at a patient's operating table . In fact, some students see in the cadaveric piece a simple tool for their study, although others see in it their own future . Studies related to education in anatomy are currently welltargeted in the teaching methodology applied in this discipline . An example of this is the debate on the use of dissection as a useful tool in anatomy classes that are still far from being solved. Technology is already part of the students' daily life and the teaching-learning process must be consistent with the reality that the student experiences in his daily life. Thus, changes in pedagogical practices in the classroom should stimulate the individual to obtain scientific knowledge and develop attitudes of citizenship in their social context . On the other hand, during the learning of the human anatomy, the formation of images of anatomical structures in the minds of many students is still complicated. In this way, several studies affirm that visual cues are fundamental for the learning of the human anatomy, especially when the environments of theory and practice, as well as virtual, are integrated, favouring a more active learning . In some disciplines, such as histology, there are technologies that are used during their teaching, among them Computer- Assisted Instruction (CAI), which allows students to learn by themselves, being guided by program sites . Unfortunately, the teaching of anatomy is very critical because of reduced access to cadaveric material by anatomy departments . Thus, it is necessary to adopt other teaching methods that are independent of cadaveric use during anatomy classes in many institutions of higher education. Currently, in addition to cadaveric fixtures fixed in formaldehyde, other teaching methods are used by teachers of higher education institutions during practical human anatomy classes in laboratories. The use of anatomical models is becoming more and more frequent; however, their use is not the most appropriate, often not showing the actual dimensions of anatomical structures and their high cost . Recently, a study using 3D impressions of body sections showed that this technology is very useful in anatomy classes due to the real dimensions that it provides for topographic relations and morphological veracity . In view of the above, this article sought to evaluate the methods most used by anatomy teachers in higher education institutions in Maceió/Al and the contribution of each one in the teaching-learning process of health academics. It was a cross-sectional, observational and descriptive study. The research was carried out at the Center of Higher Studies of Maceió (CESMAC). The sample consisted of all the students of the first year of the Medicine course. The study participants were recruited according to inclusion and exclusion criteria. Students of the first year of the Medicine course of each Institution of Higher Education (HEI) of the municipality of Maceió/AL were selected randomly, in the classroom, at the end of the same one. The teacher was then asked to allow the researcher to contact the students. The research was explained orally and a free and informed consent form was delivered prior to the start of the information collection. The anonymity of the participants was guaranteed and they were free to, even if they signed the document, at any time, withdraw their consent and stop participating in the study in progress. The students of the first year of the HEI Medicine course were included. Excluded were those with characteristics of inclusion criteria that refused to participate in the study, who had locked up or dropped out of the course, who were paying disciplines, but did not attend the entire period, and students from other courses who were paying for courses in Medicine. The students answered a qualitative and quantitative questionnaire with questions regarding the materials used during practical classes in the anatomy laboratory, the theoretical and practical methods used during a didactic evaluation, and the student's perception of the methods used and the importance of the anatomy their professional training. The questionnaire was created on a form in Word format. The data will be recorded in an Excel 2007 spread sheet for calculation and distribution of frequencies in the form of graphs. All registered data has been archived in CD's. The quantification of the participants by faculty was distributed as presented in Table 1. Table 1: The quantification of the participants by faculty. In the present study, 3 HEI‘s participated, one from the private network and two from the public network, in which one was an HEI from the state network and another from the federal network. Of the 140 students in the sample, 86 (61.4%) participated in the study. At the private HEI, 50 (58.2%) students participated; in the federal public HEI, 11 (12.8%) students participated and in the state public HEI, 25 (29%) students participated (Figure 1). The 54 (38.6%) students, who did not participate, either did not sign the TCLE or did not study full time in the HEI. 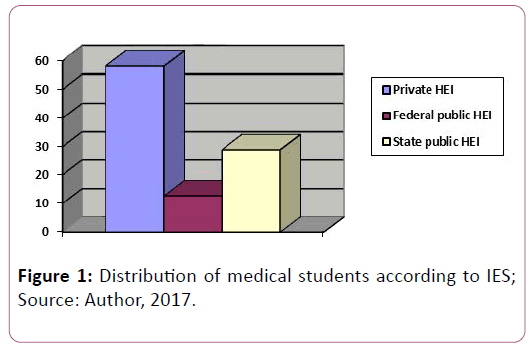 Figure 1: Distribution of medical students according to IES; Source: Author, 2017. According to the questionnaire they answered, 82 (95.3%) students reported using the book in relation to the practical method used during the practical classes of human anatomy, atlas as the most commonly used method. Of these, 48 respondents (58.5%) were from the private HEI; 25 (30.5%) respondents were from the IES public of the state network and 9 respondents (11%) were from the public HEI of the federal network. The second most used method was the use of a practical script, which made up a total of 64 students (78%) referring to their use. The third method was the use of markers in anatomical pieces, with 58 students (70.7%) reporting their use. 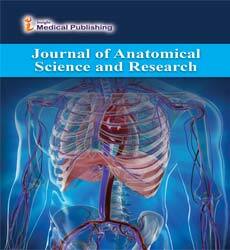 Finally, the practice of dissection was the least frequent method, and was used by 30 students (34.8%) (Figure 2). Figure 2: Practical methods most used in the discipline of anatomy; Source: Author, 2017. When asked what materials were used during the practical classes, all the students of the three HEIs (100%) responded that they used formulated corpses as their support material. 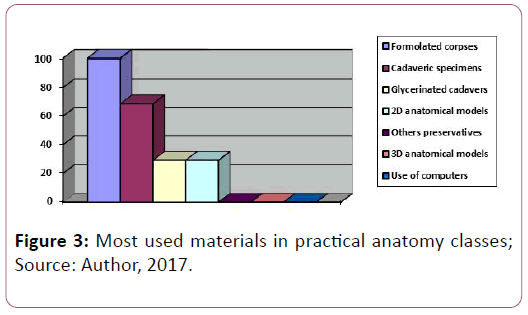 Subsequently, cadaveric specimens were referred to as material used by a total of 59 students (68.6%), followed by glycerinated cadavers and 2D anatomical models, both of which had a total of 25 students (29%) referring to their use, being all of CESMAC. No student reported using corpses with other preservatives, 3D anatomical models, or using computers as materials used during practical classes (Figure 3). Figure 3: Most used materials in practical anatomy classes; Source: Author, 2017. 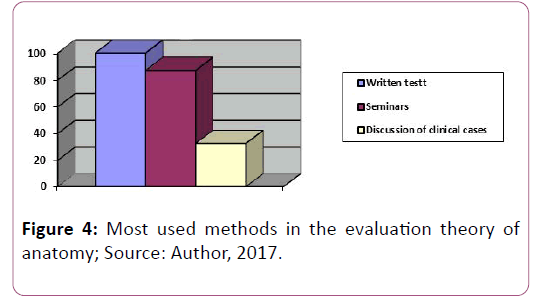 In relation to the didactic method used in the theoretical evaluation, all the students of the three HEI (100%) answered that the written test was the method used in this type of evaluation, followed by 75 students (87.2%) who reported doing seminars and, finally, 28 students (32.5%) are counting on the discussion of clinical cases in this segment (Figure 4). Figure 4: Most used methods in the evaluation theory of anatomy; Source: Author, 2017. Regarding the didactic method used in the practical evaluation, all the students of the three HEI (100%) answered that they performed rounds in the stands during the practical evaluations. Afterwards, 38 students (44.2%) reported the timing with palms as the method used in the practical evaluation, followed by the practical simulations, which was reported by 36 students (41.8%). 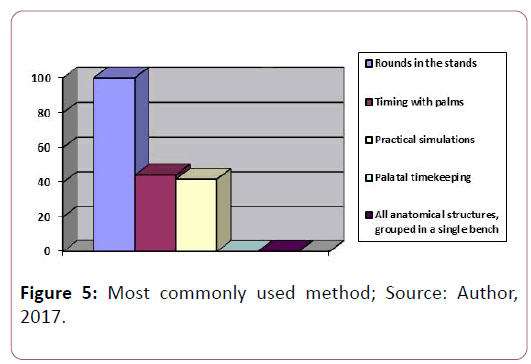 No student of the three HEI cited palatal timekeeping and all anatomical structures, grouped in a single bench-as a method used during the practical didactic evaluation (Figure 5). Figure 5: Most commonly used method; Source: Author, 2017. When asked if the student was satisfied with the material and/or method used in the class or practical didactic evaluation of the discipline of human anatomy, among the medical students of three HEIs, 3 respondents (27.3%) in the HEI of the federal public network, 18 respondents (72%) of the HEI of the state public network and 5 respondents (10%) of the private network HEIs said they were satisfied. Only 1 student (4%) from the state public HEI preferred not to respond (Figure 6). 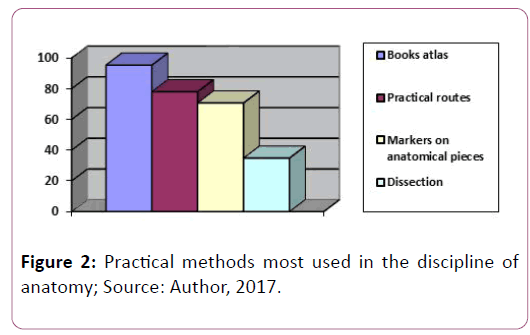 Figure 6: Percentage of students satisfied with the practical method/material used in anatomy discipline; Source: Author, 2017. Among the reasons for the satisfaction mentioned by the students are: 1) the use of dissection as a practical method, which helps to deepen the study of human anatomy and the training of the physician; 2) the use of formalized cadavers, which makes the learning. Among the students who stated that they were dissatisfied with the material and/or method used in the class or practical didactic evaluation of the discipline of human anatomy, the general reasons were: the lack of structured laboratories offered by the universities, the criteria used in the practical evaluation, the poor conservation of the cadaveric parts and the quantity available for the students, besides the limited support of the teachers during the classes in the laboratories. When asked about the students' opinion regarding the contribution of the discipline of human anatomy in professional training, in general, discipline was mentioned as being fundamental to medical training; the knowledge of the discipline as fundamental to know the human body; the understanding of it as an aid in clinical perception and surgical skills; its broad knowledge as a conducive to the diagnosis of diseases; as well as being necessary to ensure accurate and humane care for future patients. It is worth mentioning that the questionnaire allowed the student to indicate in the same question several alternatives, in this way, being able to affirm the use of more than one method and / or material in the discipline of human anatomy. In this study, the use of atlas was the practical method used by most students (95.3%). This finding corroborates with  who state in their study that the use of the atlas book is a didactic resource widely used by medical scholars. Dissection was a method used by few medical students in this study. Such finding does not agree with what was observed in which the results of his research indicated that first year students of medicine use this method during their training and become aware of this early on . It is important to note the statement of a student who participates in research on the importance of dissection during practical classes: "It is important to see the various layers of the body while dissecting. Specimens are not always sufficient as not all components (nerves, muscles, veins, etc.) are present . In the present study, the use of formulated corpses was the material considered most used among medical students. This finding is in line with the study by Babinski et al. who, in their study of 395 students from various courses, including medicine (n=35), observed that 96.2% of the students used the corpse as support material. In this study, the use of 3D anatomical models was not mentioned by the students, however  point out that the use of these models may benefit medical students because they are future users of this imaging technique, as well as the use of computers, which were not mentioned by the students. This finding does not corroborate Bucarey & Álvarez  who refer to the use of interactive atlases as a widely used resource among medical students in the United States, as when observing that websites were materials used by a considerable number of medical students in their study (37.81%) . The written test was the didactic method of the theoretical evaluation most used by the students who participated in the present study. In this regard, Zanon & Althaus  consider that objective evidence does not become advisable for university pedagogical practice, because it presents a factual focus of contents. It is worth mentioning that the written test for the student is a method that is "imposed" by the IES as an instrument of institutional evaluation, thus reducing the possibility of the student choosing not to use it. In this work, the bench top rounds was the most used didactic method in the practical evaluations of medical students. This finding is scarce in the literature, as well as the use of the other practical methods evaluated in this research. It is believed that this can occur because there are several particularities in the methods used by human anatomy teachers in the practical assessments of the discipline applied in the different institutions of higher education . In this research, dissection was pointed out as a fundamental practical method for the deepening of the study of the human anatomy and in the formation of the physician. This finding corroborates , who affirms the use of dissection as a tool that allows the student a more real study of the human body, which better visualizes the anatomical regions and structures present in each of the anatomical planes. Another student's satisfaction with the materials and/or practical methods used in the discipline of human anatomy was the use of formalized corpses, which makes the learning process more realistic. This finding corroborates what was observed by Babinski et al. when they affirm that 85.1% of the students cited the use of corpses as being important in the learning during the practical classes. In this study, the knowledge of the discipline as fundamental to know the human body was one of the contributions of the study of human anatomy referred by the students. Such finding was observed by Babinski et al. in which 92.2% of the students showed interest in the subject because they considered it important for the knowledge of the human body. Most students in this study stated they were dissatisfied with the methods and/or materials used in the discipline of human anatomy. Such findings are not in agreement with , who in a study of 225 students observed that 59.20% found the methods, used in the teaching-learning process of human anatomy to be adequate. On the other hand, Hegazy  stated that the corpses are only one mean for study of anatomy. Such study could be also achieved by other modalities such as models simulating human body, videos, films, photographs, and imaging including X-rays, MRI and CT scans. Moreover, the students could learn anatomy through attending the surgical operations even via screens. It is concluded that in this study the book atlas is the practical method most used by students during practical classes of human anatomy and that the formulated corpse is the material used by students of all HEIs who see in it the most real way to know the body human. The most used methods in the evaluations of the discipline of human anatomy in the studied institutions are the written test and the rounds in benches, and similar studies with these methods are scarce in the literature, in this way, it is important a call to carry out works that measure the satisfaction of medical students as to the use of these methods in the discipline of human anatomy. Zanon DP, Althaus MM (2017) Evaluation instruments in university pedagogical practice.